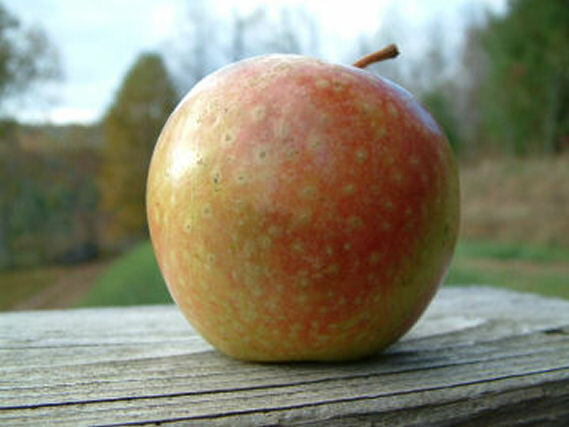 First mentioned in literature in 1804, Cannon Pearmain is a fine all-purpose apple suitable for fresh eating, drying, cooking, and cider making. Like many long-keeping varieties, it improves greatly after several weeks in storage. It is a heavy cropper and grows best in good soil at higher mountain elevations. Fruit is medium-sized with smooth yellow skin striped and marbled with dark red and crimson. The aromatic yellow flesh is crisp and firm with a pleasant, brisk flavor. Ripens late November and stores well until March.